Use GET /listingsvc/v2/listings/ to search through all active Prosper listings. You can also use this method to retrieve the listings you have invested in that have been originated. You might call this method to retrieve listings based on criteria that matches your investment risk. The GET /listingsvc/v2/listings/ method provides powerful filtering and sorting options, allowing fine-grained search and display from the large amount of listings in the Prosper active listing database. Note: We apply a “one month” curtailment rule to this file, which means that listings that were published between 10/01/2017 and 11/01/2017 are only visible after 12/01/2017. Prosper switched from using Experian credit underwriting data to using TransUnion credit underwriting data to generate loan offers on March 31st, 2017. The listings API provides the capability to inspect both Experian and TransUnion credit bureau data through the use of query parameters. All listings objects that were generated prior to March 31st, 2017 contained Experian credit bureau data. After March 31st, 2017, all new listings contain only TransUnion credit bureau data. However, you may continue to inspect Experian credit bureau data for all listings you have invested in that were created prior to March 31st, 2017. Field name Expected value Required? The starting listing within the query result set when paginating. When making calls that may return a large result set, it is beneficial to page the result set.By paginating your result set, you will get a much faster response than when requesting a larger, potentially large, data set for the limit value. Example: If your first call specifies an offset of 0, and a limit of 25, your second call would have an offset value of 25. Your third call would have an offset value of 50. Your fourth call would have an offset value of 75, and so forth. The maximum value is 500. Determines how many listings objects to return in the result set. There may be less remaining objects than the value you specify for the limit. Add this parameter to your request if you want to see TransUnion or Experian credit bureau underwriting values in the search response. By default, the listings API returns a subset of indexed TransUnion credit bureau underwriting values in a response. Note: Use this parameter judiciously. Including credit bureau underwriting values can increase response time dramatically, especially when returning a large set of listings. If you do not need the credit bureau underwriting values, it is best not to request them. biddable By default biddable is set to true. When set to true, you will retrieve active listings. When set to false, you can only retrieve listings that you own (You must set invested=true). Use this parameter in conjunction with the invested query parameter to retrieve the listings you want to view. For a discussion about how to use the biddable and invested query parameters, see below. invested Use the invested parameter to retrieve listings that you have invested in, or to exclude listings you have invested in. By default, invested is set to null. Use this parameter in conjunction with the biddable query parameter to retrieve the listings you want to view. For a discussion about how to use the biddable and invested query parameters, see below. sort_by You can sort your search results by the following return fields, in ascending or descending order. Descriptions of these fields appear later in this page. Note: The sort order value (asc or desc) should be preceded by a space. Add this parameter to return whole loans only. If set to true, the API will only return listings containing whole loans. If set to false (or missing) the API will return listings for all loan types (whole loans and partial investment loans). The default value for this parameter is false. Note: Not all investors are allowed to invest in whole loans. If you want to sort listings when retrieving all listing loan types, use the investment_typeid parameter. The following diagram shows how the biddable and invested query parameters cover the total amount of listings available to you. Below are some examples of calls you would make to retrieve listings using different combinations of the biddable and invested query parameters. All active listings, whether you have invested in them or not. By default, biddable is set to true and invested is set to null. Active listings by specific listing number (whether or not you have invested in them). All active listings that you have invested in (listings have not originated). All active listings that you have not invested in. All originated listings that you have invested in. Originated listings you have invested in by specific listing number. Note: Since a default call retrieves all active listings, any time you request originated listings you have invested in, you will have to pass biddable=false. This is true even if you know the listing number that you want to retrieve. boolean The boolean filter type determines whether or not you want to include only the specified listing. multivalue The multivalue filter type accepts one or more values as a comma-separated entry. The search will retrieve all listings that match exactly the values passed into the filter. range The range filter type should be used for executing a search either above a certain value, below a certain value, or between two separate values for the listings parameter being searched.You can append _min or _max to the filter name to denote the minimum or the maximum value for the range. Note: If the filter type value is N/A, no filter is available for the element. This field has been deprecated. A numerical value indicating the acquisition channel from which the borrower was sourced. Object containing Experian credit bureau underwriting data for the borrower. To retrieve this data, pass the include_credit_bureau_values=experian query parameter when retrieving listings. Object containing TransUnion credit bureau underwriting data for the borrower. To retrieve this data, pass the include_credit_bureau_values=transunion query parameter when retrieving listings. Note: Use this query parameter judiciously. Including credit bureau underwriting values can increase response time dramatically, especially when returning a large set of listings. If you do not need the credit bureau underwriting values, it’s best not to request them. Object containing indexed values from the TransUnion credit report that was used to generate the terms of the listing. The elements in this object are documented in more detail below. All elements in this object support range filters. The value of this element shows which credit bureau’s underwriting data was used to generate the terms within the listing. Debt to income ratio including the pro-forma monthly payment of the entire listing amount posted by the borrower. Equal to the borrower interest rate: (i) minus the servicing fee rate, (ii) minus estimated uncollected interest on charge-offs, (iii) plus estimated collected late fees, (iv) plus estimated post charge-off principal recovery. This element and filter have been deprecated. This element will only be returned for listings with a start date (listing_start_date) through August 8, 2018. You can no longer filter for this element. Estimated principal loss on charge-offs. The estimated monthly housing expense for the borrower. An indication whether the borrower has an outstanding mortgage. Average historical return for all loans within this Prosper rating expressed as a decimal. Average historical return for all loans within this Prosper rating at the 10th percentile mark, expressed as a decimal. Average historical return for all loans within this Prosper rating at the 90th percentile mark, expressed as a decimal. A textual description corresponding to the income_range number described above. The borrower stated that they could verify their stated income. A string that corresponds to the listing’s investment_typeid. Note: Not all investors can bid on whole loans. Last updated date for the listing. Note: Some fields, such as internal relationship fields, are not accessible to the search/listings API. However, updating those fields will update the last_updated_date field. Borrower also has a investor Role. 0 = Holds borrower role only. 1 = Holds both borrower and investor roles. The borrower’s interest rate less the investor servicing fee. Loan amount requested by borrower. Broad borrower-reported loan purpose expressed as an integer. This value will map to the listing_title value in your response. A textual description corresponding to the listing_status number described above. The identifier of the loan. You can use the loan_number when making a call to the loans or payments API. 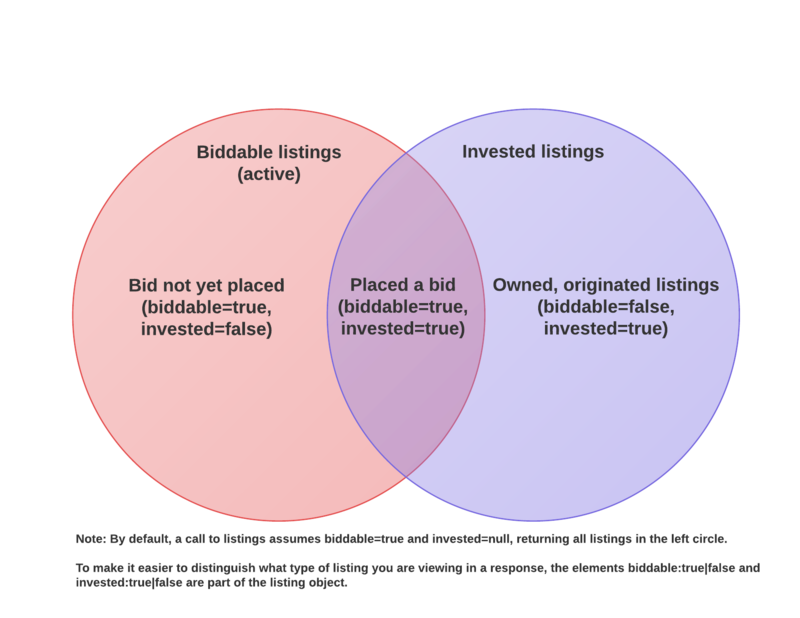 Note: This element will only appear within a listing that is owned and has originated (biddable=false and invested=true). The origination date of the listing. Smallest prior Prosper loan amount. Length of employment in months. Note: Occupation reporting is optional when a person applies for a loan through Prosper. If true, the borrower is approved for partial funding. Borrowers can choose to partially fund their listing if it is at least 70% funded at the end of the listing period. This field is not applicable when investment_typeid=2. Cycle number of the fastest early payoff of a prior Prosper loan. Number of cycles prior loans were 31+ days past due. Number of cycles prior loans were 61+ days past due. Total cycles billed on prior Prosper loans. Number of billing cycles where a late payment was made on prior Prosper loans. Number of billing cycles where a late payment by 1 or more months was made on prior Prosper loans. Number of billing cycles where a timely payment was made on prior Prosper loans. A proprietary rating developed by Prosper allowing you to analyze a listing’s level of risk. A custom risk score built using historical Prosper data. The score ranges from 1 to 11, 11 having the lowest risk. The borrower’s monthly income, as provided by the borrower. A three-stage indicator of the progress on the loan, based on Prosper’s verification of the borrower’s information and documents submitted that are key to evaluating the loan. The further along in verification, the higher the verification stage and the more likely the loan will originate. Date the listing was moved from the whole loan pool to the fractional loan pool. The long element name will be passed back in the response. If passing in a range query parameter, you may pass in the short element name. Number of all accounts (open and closed) the borrower has. This element maps to the TransUnion Credit Data at01s element. The default value for this element is 0, with valid values of 0-999. The number of open accounts the borrower has. This element maps to the TransUnion Credit Data at02s element. A special value of -4 means no trades on file. Number of open trades currently satisfactory the borrower has. This element maps to the TransUnion Credit Data at03s element. A special value of -2 means not verified in time period. A special value of -3 means no open trades this type. Number of months since oldest trade opened. This element maps to the TransUnion Credit Data at20s element. A special value of -5 means cannot calculate (required data for calculation is missing). Total past due amount of open trades verified in past 12 months for the borrower. This element maps to the TransUnion Credit Data at57s element. The default value for this element is 0, with valid values of 0-999999999. Utilization for open credit card trades verified in past 12 months for the borrower. This element maps to the TransUnion Credit Data bc34s element. A special value of -1 means no trades of this type. The number of accounts 30 or more days past due the borrower has ever had. This element maps to the TransUnion Credit Data g041s element. The number of public records the borrower has. This element maps to the TransUnion Credit Data g093s element. This element returns no special values. The number of public record bankruptcies the borrower has. This element maps to the TransUnion Credit Data g094s element. The amount of months since the most recent public record for the borrower. This element maps to the TransUnion Credit Data g095s element. Number of public record bankruptcies in past 24 months for the borrower. This element maps to the TransUnion Credit Data g099s element. The amount of months since the most recent inquiry for the borrower. This element maps to the TransUnion Credit Data g102s element. Number of trades verified in the past 12 months that are currently 30 days or more past due for the borrower. This element maps to the TransUnion Credit Data g218b element. The number of deduped inquiries in the past 6 months for the borrower. This element maps to the TransUnion Credit Data g980s element. Number of months since oldest revolving trade opened for the borrower. This element maps to the TransUnion Credit Data re20s element. The number of months since the most recent public record bankruptcy for the borrower. This element maps to the TransUnion Credit Data s207s element. Total balance in USD of open revolving trades verified in the past 12 months for the borrower. This element maps to the TransUnion Credit Data re33s element. Total balance of all revolving trades verified in past 12 months for the borrower. This element maps to the TransUnion Credit Data re101s element. This example assumes the call was made near the two week window of the listing being activated. The following example retrieves all active Prosper listings, with a limit of 25 returned listings. This call also returns both Experian and TransUnion credit bureau underwriting data for each listing in the response. Note that any listings created after March 31, 2017 will not contain Experian credit bureau underwriting data.